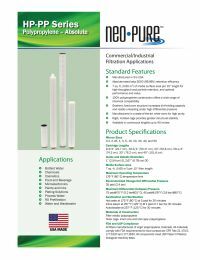 Neo-Pure HP-PP High Purity Polypropylene Filter Cartridges are manufactured in the USA in a state-of-the-art white room. They are absolute-rated Beta 5000 (99.98%) retention efficiency for high purity applications. HP-PP Series filters feature a rigid, molded cage for greater stability and 7 sq. ft of media surface area per 10″ length for high throughput and particle retention. All filter materials comply with the FDA CFR criteria for food and beverage contact and meet USP Class VI Biological Testing for plastics.